At Aviation Insurance Resources, better known by the acronym AIR, we offer a wide range of aircraft insurance options for aircraft of all makes and models, from experimental aircraft to standard aircraft, such as Cessna Aircraft, Beechcraft, Cirrus Aircraft, Robinson Helicopters, Piper Cubs, and Corporate Aircraft. We know aviation insurance inside and out. We know the needs of our clients inside and out, as well. How? Here at AIR, our agents are also our clients. 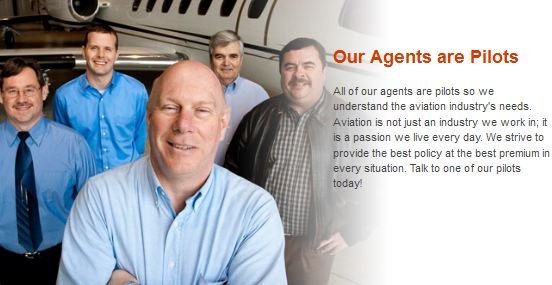 Each and every one of our agents is also a pilot, so each understands your needs as a fellow pilot. Aviation is not just an industry we work in; it is a passion we live every day. As fellow aircraft owners, AIR understands your needs and challenges in owning an aircraft. Whether you fly a Seaplane, Experimental/Kitbuilt, Light Sport Aircraft (LSA’s), or Warbird, AIR can provide an economical insurance solution for your needs. We strive to provide the best policy at the best premium in every situation. Talk to one of our pilots today to learn more. Our pilots come from diverse backgrounds in aviation. Many have been flying since they were young and have owned their own aircraft. Ranging from private pilot to commercial pilots and CFIs, AIR agents have a multitude of hours in single engine, tailwheel and multi-engine aircraft. Jon Harden currently owns a Pitts and a Cessna 180. You can find him at the airport flying his beloved tailwheel aircraft any chance he can get and he would love to hear about yours! Chris Wolbert has a family of four and likes to fly aircraft with enough seating for the whole family. He is the perfect pilot to assist you in insuring your family aircraft! Gregg Ellsworth’s dream aircraft is a F4U Corsair, but he specializes in light sport aircraft insurance. He is very knowledgeable in Cub Crafters aircraft, Zodiac and Flight Design insurance and more! Jon Shimer’s favorite flight of the year was in a single blade prop J2 Cub. He has over 300 hours logged in various Piper Cubs and is happy to help you out whether you are a low time or a high time Cub flyer or fly jets. John Sweeney’s favorite airplanes are the Cessna 182 and the Aeronca Champ. John would be happy to assist you in insuring these aircraft or if you are renting and need non-owners insurance. John also manages our S.A.F.E (Society of Aviation Flight Educators) program and is the exclusive provider for CFI non-owner insurance. Victoria Neuville flies a Glasair 1RG on weekends and hopes to upgrade to a Glasair III someday. She knows transitioning to a Glasair can be quite a challenge and can help the insurance portion go smoothly. Lee McKinley is an A&P and a commercial pilot. From airport insurance to aircraft needs, customers continue to come to Lee for his dedicated and knowledgeable service. Melissa McKinley, Lee’s daughter, grew up in the aviation industry and has been working with her father in aviation insurance for about 15 years. From certified to experimental aircraft, Melissa knows a lot about the industry and how to find the best rates in aircraft insurance. Joe Cacho resides in sunny Florida and favorite airport to fly to is KEYW in Key West. Do you have an airplane based in the Keys? Maybe Joe will fly down to help you get some great rates on insurance! Joe Ruck loves the Cessna 177 Cardinal and insures many Cardinal flyers, in fact, Joe manages our Cardinal Flyers Online insurance program. Whether you are looking for fixed gear or retractable Cardinal insurance, Joe Ruck is your agent! To find out more about Aviation Insurance Resources or our agents, please contact AIR by calling 877-247-7767 or visit AIR-PROS.com today to receive your free Aircraft insurance quote!